Don’t get me wrong. I love my oatmeal with cinnamon and sugar but every once in a while a girl needs a savory bowl of oats and this simple breakfast is spot on! I’ve been making miso butter a lot recently and it’s wonderful served with roasted veggies, meat or simply smeared onto a piece of toast. This breakfast is a great way to switch up your morning bowl of oats and I hope you all love this as much as we do. Feel free to add any other veggies to this. I think sautéed mushrooms would be a great addition here. We used leftover snow peas from dinner but feel free to play around here with what you’ve got. Just don’t skip the fried egg! Cook the oatmeal according to package directions with a pinch of salt and pepper. 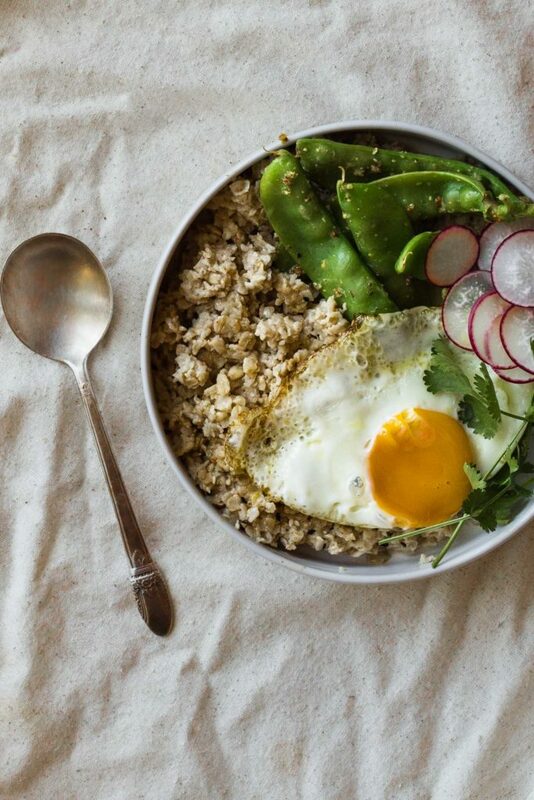 Divide the oatmeal between bowls and stir in 1-2 tablespoons of the miso butter (or to taste). Top with fried egg and toppings of choice. Serve warm. I’ve actually never had oatmeal savoury before. Always thought of them as a sweet treat for breakfast, but this could make a great dinner or lunch, too! I always make savory veggie-egg oats by sauteing the vegetables (carrots, cabbage, etc) in the pot with a bit of oil, then boiling it all together with the oats for a bit before cracking in some eggs. It makes a really hearty, satisfying breakfast. It will be interesting to try this version where it’s all separately cooked! Especially adding miso! brilliant post! I love miso with my oatmeal! And greens slightly wilted. Will add an egg from now on as well! Yum. Used this as inspiration. Served oats with leftover miso roasted parsnips, daikon, your delicious miso butter, a boiled egg I had on hand and sriracha. Thank you for creativity. It was the perfect breakfast after a chilly morning run.